Look out for the latest issue (111) of ‘Stitch’ magazine and follow my step-by-step project to create a bijoux bag. 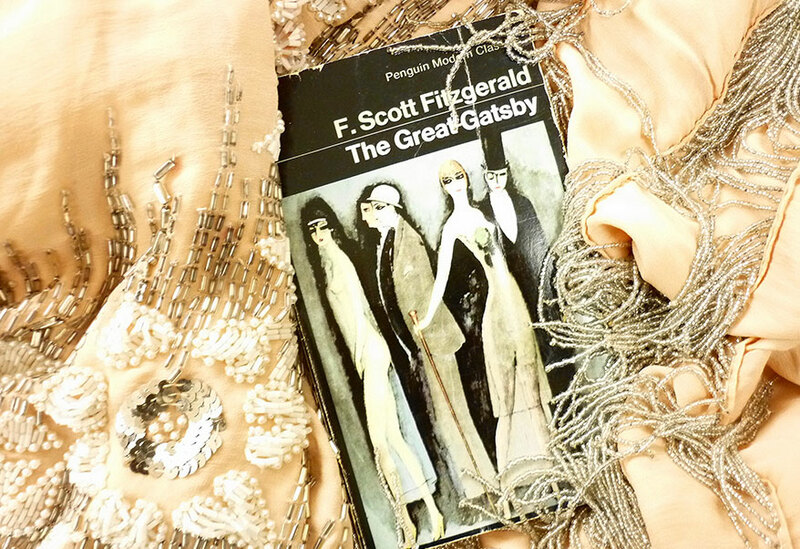 The magazine editor invited embroiderers to create a project inspired by literature, I could not resist delving into the world of F. Scott Fitzgerald’s and chose his famous, literary masterpiece: ‘The Great Gatsby’. Creative stitch steps into the world of F. Scott Fitzgerald…………. 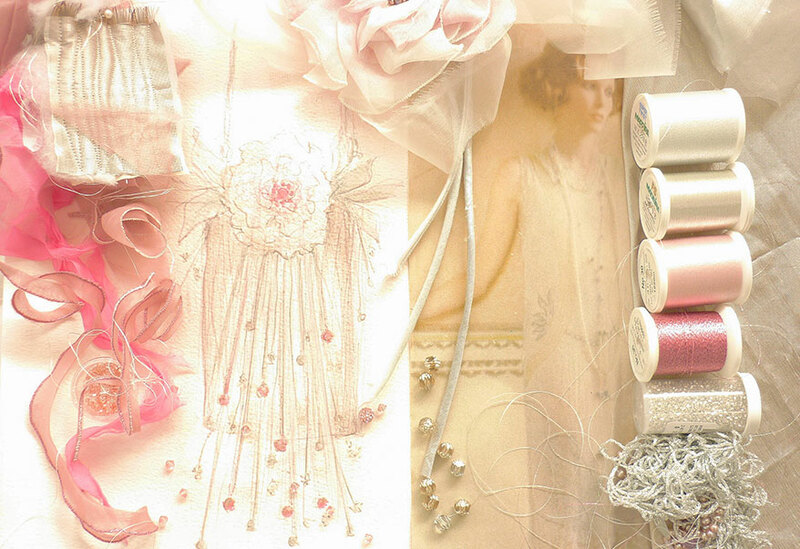 Pin-board for ‘The Great Gatsby’ purse: delicate shades of pale,rose pinks mingle with silver shimmer, evoking the romance of Daisy’s summer garden, in the novel. A reference also, to the gentle colour palette of a beautiful, original beaded flapper dress I own ( catch a glimpse in the photo with ‘The Great Gatsby’ book). Prior to commencing any stitching on the sewing-machine, a ‘mood-board’ is created to guide the selection and direction of design ideas. Here, the pin-board show a photo of Mia Farrow, who starred as Daisy in the 1970s adaptation of the Scott Fitzgerald’s book, Robert Redford took the role of Jay Gatsby. I still have all the magazine cuttings showing the fabulous 1920s costumes from that movie, the dreamy image of Mia in ethereal silk and dangling strands of pearls was my starting point. Plunging into my studio stash of fabrics, threads and beads provided an array of perfect materials for a bijoux purse; the selection on the pin-board shows: silk lurex dupion, metallic lame, silk organzas; Swarovski crystals, pearls, sequins; machine-embroidery threads in silvers, pearls and pinks. A fragile mix of glittering ingredients to style and stitch a party purse. Stitch techniques and embellishments looked to the spirit of flapper parties and dance frenzy, recalling the glamour of the party held at Jay Gatsby’s mansion, in the novel. Echoing the free-flowing fringes of the flapper evening dresses, I chose rouleaux weighted with glass or crystal spherical beads, stitched cords trailing from a large silk organza rose embellishment ( see sketch on ‘mood-board’ photo); machine-quilting created a shimmering, swirling background for the purse decorations. Fancy rouleaux frequently appear on my fashion accessories, I am reminded of another evening bag made in 2003, velvet with a lavish fringe of silk rouleaux, it also paid homage to the world of Scott Fitzgerald, a bag design named ‘Zelda’, for a girl who loved to dance the night away! Just a peek into the story behind ‘The Great Gatsby’ inspired purse, created for ‘Stitch’. For all the details of my studio techniques, follow the step-by-step project: from paper patterns to finished purse (Issue 111 ‘Stitch magazine U.K., available from January 25th 2018). Step into my studio world and enjoy creative stitching inspired by the pages of F.Scott Fitzgerald.